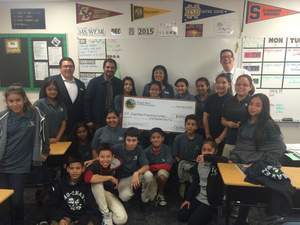 SAN DIEGO, CA--(Marketwired - Dec 8, 2015) - Students and educators at King-Chavez Preparatory Academy in San Diego's Logan Heights neighborhood received a $5,000 education grant today from the Barona Band of Mission Indians. The academy will use the grant money to purchase 12 LG Chromebooks to assist in updating one of the two technology labs. California State Senator Ben Hueso from the 40th District sponsored the grant for King-Chavez Prep, which teaches students from sixth to eighth grade to not only be academic achievers but also socially conscious and caring individuals. "It is an honor to present this education grant to the staff and students at King-Chavez Prep, a charter school that works hard each and every day to close the achievement gap for inner city students," said Clifford LaChappa, Chairman of the Barona Band of Mission Indians. "With this grant, they'll be able to purchase the technology they need to ensure their students are on track for success."